Rollie Fingers was one of the first pitchers to be used exclusively as a reliever and his success would change how pitching staffs are built today. Fingers' ability to close out tight games made him the all-time saves leader and earned him a trip to Cooperstown as the second relief pitcher ever selected. 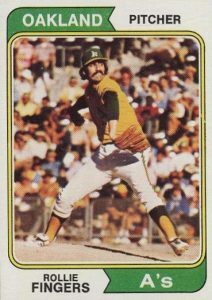 This list of the best Rollie Fingers baseball cards includes several budget-friendly options. Fingers played a key role as the Oakland A's won three consecutive World Series in the 1970s and he even took home the 1974 World Series MVP. Named the best reliever in baseball four times, Fingers found renewed success towards the end of his career while pitching for the Milwaukee Brewers. In 1981, he won home both the Cy Young and the AL Most Valuable Player Award, becoming just the sixth pitcher to achieve that feat in the same season. 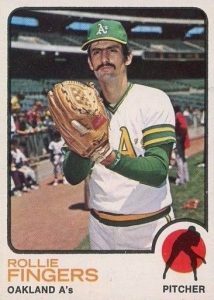 Shop for Professionally Graded Rollie Fingers cards on eBay. 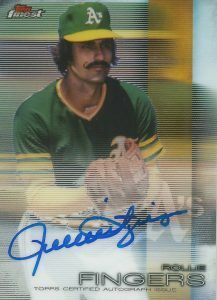 Brewers fans looking for Rollie Fingers autographs and memorabilia cards are in luck as he has been included in many recent sets. In 2016 Topps Triple Threads, fans can find autographed relic cards that spell out such phrases as "Roland," "Handlebar," and "341 Saves." In both the 2015 and 2016 Topps Archives Signature Series sets, Fingers signed his earlier Topps cards originally issued during his seasons with the Brewers. In 2014 Panini National Treasures, many Fingers relics were included and some of those can be found at a bargain as the lack of major league logos limits interest with some collectors. Oakland A's collectors also have no shortage of Fingers autographs as they can be found in such sets as 2016 Topps Strata, 2016 Topps Legacies of Baseball, and 2016 Donruss Optic. Beyond autographs, 2002 Topps Super Teams features multiple base cards in honor of the A's three consecutive titles in the 1970s. 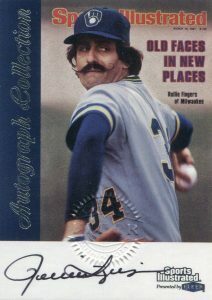 Rollie Fingers is one of the few baseball players to have his number retired by two teams, creating two fan bases interested in his baseball cards. In determining the cards and their placement on this list, card value is used as the key component along with card design and availability to the collector. Collectors could find three cards from the 1975 Hostess set on the bottom panel of family-sized Hostess packages. Thankfully, the packaging designers gave each card its own individual borders which allowed for well-cut cards to enter the market. Fingers shares his panel with Houston Astros first baseman Bob Watson and New York Yankees first baseman John Ellis. Collectors have put a high premium on uncut panels from the set. Fingers is about to deliver a pitch on his 1974 Topps card and the reverse side highlights Rollie's dominance in the playoffs for the A's during their remarkable run in the 1972, 1973, and 1974 World Series. Fingers either won or saved eight of the 12 World Series games the A's won over those three seasons. He took home the 1974 World Series MVP after saving two games and winning a third during that series. Fingers' famous mustache made its baseball card debut in 1973 Topps. His trademark look came to be after Oakland A's owner Charles Finley offered $300 to the Athletics player that could grow the best beard or facial hair after slugger Reggie Jackson arrived at spring training with a beard, something uncommon for players to have at the time. Inspired by players from the early days of baseball, Fingers grew a handlebar mustache, won the contest, and became famous for it. Oakland A's fans looking for a more recent on-card Fingers autograph can turn to 2016 Topps Finest for a great example. Rollie's Finest autograph comes on a chromium stock with several numbered parallel versions including blue, green, orange, and red. Rollie's signature is a difficult one to decipher letter-for-letter but common features of it include the capital letter "R" that resembles the number nine and the capital letter "F" that loops back into the first name of the signature. The 1975 Topps Mini set was identical in the design of 1975 Topps except that it was 20% smaller in size. The smaller size had let Topps print the cards much more efficiently in hopes of maximizing profits on this test product that was not available nationwide. It is said that the cards were only available in Michigan and California but collectors today have no difficulty in finding cards from the entire set available on the secondary market. Minis are often considered to hold double the value of standard 1975 Topps cards and a huge premium is placed on those very rare, mint condition cards. 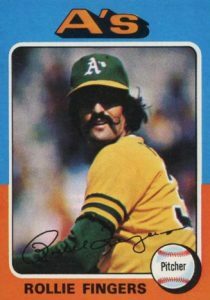 Rollie's 1972 Topps card would prove to be his final without his signature mustache which he kept for the rest of his career and beyond. 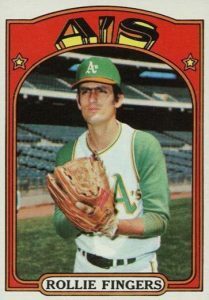 Fingers played with the Athletics through the 1976 season and, over the course of his career, he was traded to two teams that he would never actually play for. He was sold by the A's to the Boston Red Sox with that deal ultimately being nullified by the Commissioner. Later, the Padres traded him to the St. Louis Cardinals, who in turn traded him to the Brewers without Rollie ever pitching for them either. The uniqueness of 1971 Topps, including its black borders and lower case lettering, continues to make the set very popular. 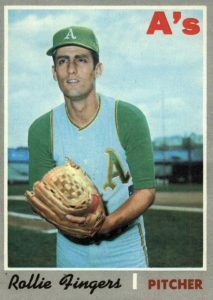 The '71 card features him in the green and light blue A's jersey which was actually a vest rather than a single jersey top. The back of the card highlights Fingers' minor league pitching record. Before signing with the Kansas City A's, he was offered a contract with the Los Angeles Dodgers. However, he turned it down because he thought his pitching prospects would be limited given the strong pitching staff already in place. Fingers' overall popularity may have peaked during his stint with the Milwaukee Brewers. In 1981, he helped lead the team to their first-ever playoff appearance in franchise history. He also became one of the few pitchers to win the Most Valuable Player Award and Cy Young in the same season. The 1999 Fleer Sports Illustrated set honors his appearance on the cover of Sports Illustrated from March 16th, 1981, and it is a beautiful card that highlights the famous handlebar mustache. 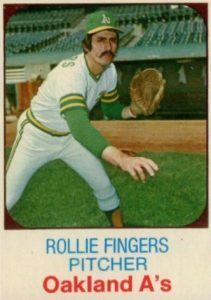 The earliest solo baseball card for Rollie Fingers can be found in 1970 Topps. In his first full season with the A's, Fingers appeared in 60 games and racked up 12 saves. When Fingers was elected to the Hall of Fame in 1992, he became the second reliever to be elected after Hoyt Wilhelm. It would be Wilhelm's career record of 227 saves that Fingers would surpass during the 1980 season. Ultimately, Rollie would set a new record of 341 career saves when he retired in 1985. While many Topps sets displayed their rookies and prospects by team, the 1969 Topps rookies were grouped simply by league. 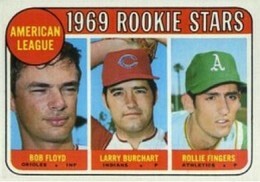 Rollie shares his rookie card with Cleveland Indians pitcher Larry Burchart and Bob Floyd, an infielder for the Baltimore Orioles. While Floyd and Burchart had limited careers, Fingers would go on to become one of the first superstar relief pitchers. 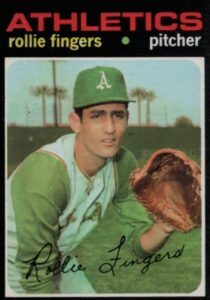 At auction, mint graded copies can approach $400 but if you are a collector on a budget who doesn't necessarily require perfect quality cards, the 1969 Rollie Fingers card might be a great place to start your Hall of Fame rookie card collection. Rollie Fingers Original Rookie Card Priced To Sell! Nice Card!